My Job: Create 30 full-color illustrations for a children’s picture book called Sir Stan The Bogeyman. Once in a while a book illustration project comes along and I just feel the potential in it. 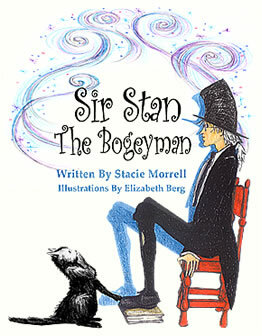 Sir Stan the Bogeyman is a timeless, beautifully written story poem. I believe the quality of this well written story will stand solid anywhere in history, in the present, and into the future. It’s wonderful for me, as an illustrator, to work with such a gifted writer. I had about a year to hold the manuscript before Stacie Morrell, the author, was ready to go forward with her second book. Having grown up with fine books and fine art, I’d like to think I have cultivated a good taste for the good stuff. After the first read of Sir Stan The Bogeyman… it was like the first time I ate a piece of real chocolate. Delicious. The illustration process, to me, is always delightful. I get to open my mind to multi-layered visions for each manuscript. Nurturing of those visions goes on and on, through the end of my day, into the evening, and through the night, where my paper and pen are nearby, so I don’t lose a morsel of any scene or inspiration. The main character of this book, Sir Stan, popped into view with his top hat, and he was already animated with a slight ungainly walk, as he was not used to his tall legs when he first found them. Then I saw his refreshing movements, facial expressions, and hand gestures. Those details of his features animated the depth of a personality with both their joys and anguish. Now Sir Stan is one of my inner companions. Along with all the other main and minor characters that live on in my illustrated heart. Ah, the joy of good stories! I hope you find the places in Sir Stan’s life alive with detail and feeling from Stacie’s verse and my illustrations. Let’s learn to cultivate and honor our ability to feel deeply because it is certainly one of the most wonderful things about life and the stories we love to tell. Available through Amazon (Print), Amazon (Kindle Version), and Createspace Book stores. Elizabeth Berg is a fantastic person and professional to work with. Not only is she wonderfully talented, she listens to her clients and works with them. It was such a pleasure to create Sir Stan the Bogeyman with her. My Job: Create book illustrations and cover for a children’s Christmas book called Little Joe’s Christmas. James Conroy came to me with a personal experience in story form. It had a positive message for every child, and a loveable conclusion for adults to reinvigorate the Christmas spirit in all of us. His friends convinced him to turn it into a children’s book. I enjoyed his story as he shared it with me over the phone. We both live a very long way from each other, so this project, as with many assignments, needed to be done by email, fax, and snail-mail. He said that he could get photos of the characters in the story for me to use. I needed to create a simple version of the characters from life photos, and that was really fun! We spoke on several occasions. I asked him a set of questions after contemplating his story. We really enjoyed some excellent discussions. One of which was to share that illustrating his story, or any story, is bit like being a director of a movie. You set the stage and then choose a vantage point for each scene. Will it be a close up or from a different vantage point? All of that seemed to help him visualize this book with me. Our phone meetings went smoothly as we sorted through the corrected, improved, or clarified numbered illustrations that I had sent to him in progressive sketch form. I offered a layout design, not his initial request, to give him another way to see the finished package. All along the way, I attempted to provide a way to see the flow from scene to scene. James wanted a particular picture image for the cover. I just had to step up to recommend the illustration that is on the cover now. I’m very happy we both agreed. I believe the cover conveys the gentle, meaningful content of his story. 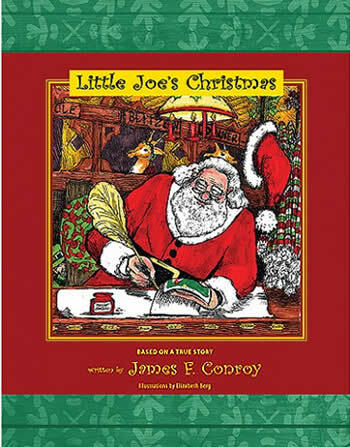 I’m so delighted to receive James Conroy’s lovely letter to me (below) about working on Little Joe’s Christmas book. Available through Amazon, Barnes and Noble, and Powell’s Book stores. Working with Elizabeth Berg was a complete delight. Searching for an illustrator for my children’s Christmas book, I acted on my publisher’s suggestion and called Elizabeth. It took one conversation to decide that Elizabeth would be my illustrator. Elizabeth displayed her professional approach throughout the project. She accurately interpreted my description of each illustration. Over several phone calls, a friendly collaboration developed which allowed for much give and take. She graciously accepted any criticisms, and agreed to any of my demands. Elizabeth’s sixth sense of knowing what I wanted allowed her to offer excellent suggestions, and coupled with her professional eye and artistic expression, she enhanced each illustration. By ensuring colors, objects and features remained constant in applicable illustrations; Elizabeth’s attention to detail was consistent throughout. Her vision and talent to add objects and style improved the images. Elizabeth’s displayed her skill by capturing the emotion in each facial expression and by using rich vibrant colors; she magnificently lent depth to each illustration beyond my imagination. 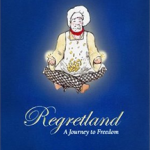 My Job: To create the main character of the story, artwork for each chapter heading, and design the cover art for a book called Regretland. The author, Adrienne Golday, and her husband spoke to me about the story. I had not yet been given the manuscript. I was asked to create first, the leading character in the story, his name is Joe. As you can see Joe is an average kind of guy. He wants to do the right thing. In the context of the story Joe goes on an elaborate journey which becomes a life review, that leads him through many interesting places. I also needed to illustrate all the places Joe went to as separate chapter headings. See all my chapter art below. I loved having the opportunity to work with both the author and her husband. It gave me two different perspectives and the third being my reading of the manuscript. It gave me a well rounded idea of what direction I needed to focus on to create the illustrations for the Regretland book. 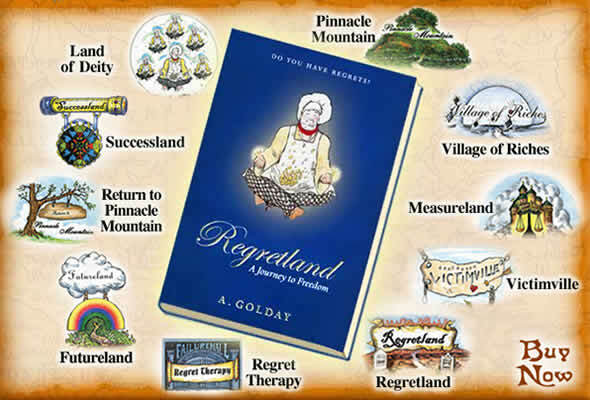 I would like to take this opportunity to thank Elizabeth Berg for the beautiful artwork that she created for my most recent book entitled: Regretland. Elizabeth's artwork made every chapter come alive. Readers all over the world have expressed praise for the artwork in the book. They enjoyed how she visually gave life to the main character, Joe! I am so grateful to have had the opportunity to work with such a talented artist. 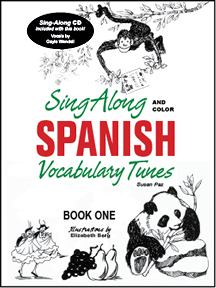 My Job: Create a book cover and images for each song for a Sing-Along Spanish Coloring Book & Vocabulary Tunes CD. Sue Paz, the author, and I had enjoyed working with her multi-media educational Spanish/English book project. She wrote all of the Spanish and English poetry and set it to familiar tunes. Sue and I read through all of her material together. Sue would share her vision for the illustrations. I then sketched out ideas and presented them to her. We would revise the images, sometimes, for instance… taking a different visual vantage point. Listening to the progress of the music CD helped to enhance the images and align them with the stories in the poem/songs. It was a totally delightful project to be a part of. I think that the light heart we felt as we were putting it all together is visible and audible in the production of Sue’s multi-media educational Spanish/English book project. The end result is a wonderful, educational Spanish/English musical coloring book and CD. 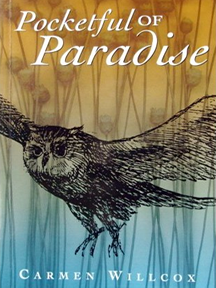 My Job: Create a full color illustrated cover and vignettes for each chapter Pocketful of Paradise book. This book is a diary style narrative set in modern day England. The author, Carmen Willcox, contacted me from her home in Suffolk. Carmen was looking for illustrations with hand drawn frames for each of the chapters. Her pleasingly relaxed images in words made it easy to produce a vignette illustration to set the ‘flavor’ for each of the chapters. She knew exactly what she wanted, classic pen and ink drawings, fairly realistic. She and I wrote to each other to process the project from beginning to end. I was particularly pleased with the cover when I finally received the finished product in the mail. My Job: To create a bookcover that represented the core meaning of the book called Flowering Woman and to also create several illustrations that illuminate the sensitive and subtle meaning in each of the chapters. Flowering Woman is a precious story of girlhood to young womanhood. 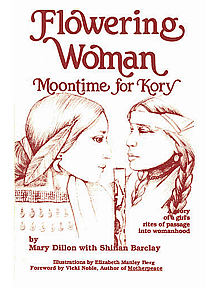 Mary Dillon, the author, and I spoke about the value of bringing this sensitive story out into the world for girls to have an opportunity, within the context of the story, to place a high value upon the menses as an honorable change in a girl’s life. I was honored to be asked to design and produce the illustrations. The cover art I designed for the book has two women facing each other, Kory and an elder woman. The story is emotional and powerful. I am pleased to have been given free reign to illustrate this book as I felt compelled to, being inspired by the quality of the author’s work.This book has become a collectible.